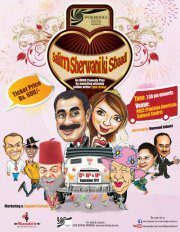 Urdu Comedy Play "Salim Sherwani ki Shaadi"
An Urdu comedy "Salim Sherwani Ki Shaadi" written by an award winning Indian author Zahir Anwar. The play is being directed by Wormhole Productions (Head of Theatre) Hammad Zubairi. For updates and information keep tune in.